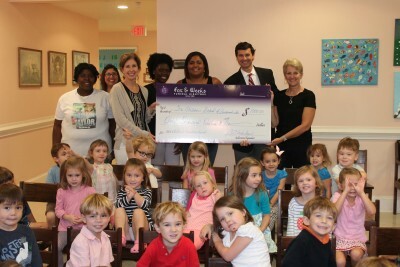 Fox & Weeks Funeral Directors was proud to present a Matthews Children’s Foundation grant in the amount of $1,000 to The Children’s School at St. John’s Church. The Children’s School is a preschool and “mother’s morning out” program serving ages 15 months through Pre-K that is committed to providing a Christian learning environment for young children. The primary goal of the preschool is to develop children who are confident, motivated, creative, and eager to learn based on the belief that each child should develop spiritually, intellectually, physically, and emotionally in order to be a well-rounded individual. The grant money will be used to purchase new playground equipment for the school’s outdoor play area.